Most of the stadium might have shown its age, but thanks to its new outer skin Estadio Multiva is one of the world’s most unique grounds. We asked its creator what was the biggest challenge. With the overall surface of around 30,000 square meters the new outer wrap of Estadio Multiva is among the world’s largest stadium skins. For reference, Allianz Arena has 26,000 square meters of ETFE cushions (roof not included) and Stadion Narodowy 23.500 sqm. We thus decided to ask this grand façade’s creator about his work. “The biggest challenge was to work in an existing venue. When the stadium was first built it was never considered to have this wrap, therefore there were great structural challenges to solve. Ironically, these challenges were also great opportunities as lighter elements needed to be considered, allowing the use of ETFE as the main cladding element”, says Javier Rattia, Co-funder and Commercial Director of DÜNN Lightweight Architecture. As we previously wrote, initially the stadium was to be covered with 8mm-thick tempered glass. The design was changed by DÜNN, though. Much thinner and lighter ETFE allowed to provide savings in construction material. The steel support structure weighs 1,000 tons instead of previous 2,500 despite significant height of 40 meters. The en tire wrap consists of 6,144 single ETFE sheets. These were combined together on site, creating vertical stripes of 48 sheets each, now strung proudly between the steel pylons. Altogether 300 people worked two shifts on the site to create and install 128 vertical stripes of canvas. All these sheets represent five colours: white and four shades of blue. Why such a combination to create the mosaic? “The exact arrangement of colours was determined by our client, the Government of Puebla; it involves the colours of the team as well as the local identity of crafts known as Talavera” says Javier Rattia. Talavera is beautifully decorated (often blue) pottery from the region of Puebla, which seems to be a clear link between crafts and the stadium. 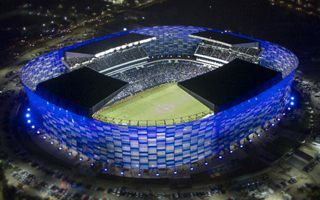 The vast outer cladding is illuminated by a system of LED lighting located both inside and outside the stadium. This allows to use the ETFE sheets as a giant screen, as was seen during recent display of solidarity with France. In that sense the entire outer wrap is one solid piece. But structurally it’s not as integrated, which might prove useful if further expansions are made by building upper stands in the corners. “Each element is connected separately there for allowing for future expansion without dismantling the whole facade.”, Mr Rattia concludes.